Last week I got back to the DR after two full weeks in the States! It felt like the perfect amount of time - I was able to see a lot of friends and family, and wasn't completely rushed in booking appointments, eye exams, hair cuts, etc. Boyfriend came with me for the first 5 days, which meant some sight seeing and lots of introductions to my favorite Chicago foods. I remember living downtown Chicago and the smell of Garrett's would linger in the air a block away from the store - it was a constant challenge to walk past Garrett's without stopping in for a bag. Garrett's makes the best caramel, and a killer cheesy popcorn for those who prefer salty popcorn. Despite what the cashier told me about it "losing its freshness" after a day or two, it was still amazing a week after gifting it for Mother's Day. A perfect Chicago souvenir. I've had pizza in all parts of Italy, but if I had to choose between a slice of Italian or Chicago pizza, I would still choose Chicago-style! 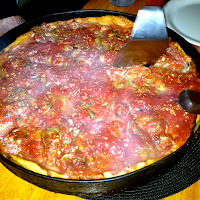 Chicago pizza is a thick pizza with a softer crust, and the tomato sauce is what you see on top of the pie instead of the cheese. Pizzeria Uno's and Due's are the most famous places to go for pizza in Chicago - not to be confused with Uno's the franchise restaurant that has sprouted all over suburbia - it is NOT the same pizza. If you don't have a Greek yiayia to make you food from the motherland whenever you wish, then visit Greektown. Its very small, only a couple of city blocks, but its filled with authentic Greek restaurants and small shops - even the Walgreens on the corner has signs in Greek! Saganaki (a lemon-drizzled sizzling cheese that the server will light on fire) and baklava will never let you down. but i pefer kantaifi than baklava for desert!